Hatem Baziam: This vile Jew-hating jihadi is a professor at the University of California at Berkeley. Bazian uses his class assignments to indoctrinate students to oppose criticism of jihad terror and the brutal sharia. The Nazi-like march of Islamic supremacists into influential positions of power in media, politics and academia hit a new low this week. Tarek Fatah received a panicked message from a student enrolled at the University of California Berkeley. Professor Hatem Bazian, who teaches at the University of California, Berkeley, is requiring his students to tweet weekly on Islamophobia, according to a column in the Toronto Sun. Another requirement of Bazian’s class, entitled De-Constructing Islamophobia and History of Otherness, is for students to get reactions from “people of color” on ads critical of radical Islam placed by Pamela Geller, author of the blog Atlas Shrugs. Geller said she believes Bazian is indoctrinating students. “The very idea that he is surveying ‘people of color’ about my ads is ridiculous and offensive. Jihad terrorism is not a race. The Islamic oppression of women, gays, and non-Muslims is not a race. What has Hatem Bazian ever said or done in defense of the non-Muslim ‘people of color’ who are victimized by Islamic jihadists in Nigeria, Egypt, Syria, Iraq, Pakistan and elsewhere?” Geller said in an email to the Free Beacon. Darwish, who escaped Sharia law, took issue with Bazian’s assignment for students. “Bazian appears to consider those who criticize Islam as Islamophobes. He is marking people like myself and many other former Muslims who escaped life under oppressive Sharia law as some kind of nuts who have unreasonable fear,” Darwish said. “American parents who get in debt to educate their kids are cheated with indoctrination instead of education of their kids,” Darwish said. Hatem Bazian [Hatem Ahmad Bazian] is the founder of the anti-Israel organizations Students for Justice in Palestine (SJP) and American Muslims for Palestine (AMP). Bazian is a lecturer in the Department of Ethnic Studies at the University of California, Berkeley (UC Berkeley), where he founded the Center for the Study of Documentation of Islamophobia. He has claimed that pro-Israel advocates are the primary source of Islamophobia in the United States. 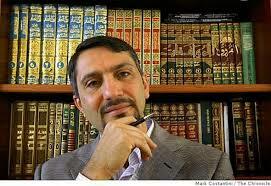 Bazian is also the Provost, co-founder and faculty member of Zaytuna College for Muslim Studies (Zaytuna). As a graduate student, he headed the General Union of Palestinian Students (GUPS) at San Francisco State University (SFSU) as well as the Muslim Students Association (MSA) at UC Berkeley. Bazian is a leader within the Boycott, Divestment, Sanctions (BDS) movement. He declared September 23, 2014 an “International Day of Action” to call for a complete boycott of Israel on campuses across the United States on the eve of the Jewish New Year, Rosh Hashanah. Bazian writes prolifically against Israel, publishing his work on his personal website and in other online sites including Mondoweiss and Electronic Intifada. He is the author of an anti-Israel book titled “Palestine … it is something colonial”. As a graduate student at San Francisco State University (SFSU) in the 1980’s, Bazian fomented an anti-Semitic environment that persists at SFSU until today. Bazian served as president of SFSU Associated Students, the Student Union Governing Board and GUPS. In 1994, Bazian organized a press conference to support an anti-Semitic mural that depicted Malcolm X’s face surrounded by dollar signs, stars of David, skulls and crossbones and the words “African blood.” Jewish students were forcibly excluded from the event. Under Bazian’s leadership, GUPS rejected an invitation from SFSU’s Jewish Student Action Committee to forge a “peace treaty” during the first intifada. After graduating from SFSU, Bazian continued his studies at UC Berkeley, where headed the campus MSA and founded SJP in 2001. At an April 2004 rally held in San Francisco in support of the Iraqi insurgency, Bazian called for an “intifada” [violent uprising] in the United States. In 2011, Bazian headlined a national speaking tour called “Never Again for Anyone” — launched on International Holocaust Remembrance Day. The tour was organized by the International Jewish Anti-Zionist Network (IJAN), the Middle East Children’s Alliance (MECA) and AMP. According to an official statement by IJAN, the goal of the tour was to reveal how Zionists “exploited Nazism” and the genocide of European Jewry to build a Jewish state. Another goal of the tour was to analogize Zionists with Nazis by comparing Gaza to the Warsaw Ghetto. During a 2016 talk to promote his book — “Palestine… It Is Something Colonial” — Bazian argued that European Zionists “partnered with anti-Semites rather than actually challenging the basic assumption of anti-Semitism” by fleeing Europe and founding a Jewish state. During a 2014 speech, Bazian implied that the United States Congress is controlled by the American Israel Public Affairs Committee (AIPAC), suggesting that AIPAC “bought” Congress and dictates American foreign policy. In another 2014 video for an “educational initiative,” Bazian stated that the American “political leadership is beholden to a particular political influence in this country named AIPAC” that has “almost a stranglehold on a particular aspect of our decision making abilities” in order to maintain a particular world order. In 2004, Bazian was a featured speaker at a fundraising event titled “Palestinians in Agony!” for KindHearts for Charitable Humanitarian Development (KindHearts). KindHearts dissolved in 2011 after the U.S. Treasury discovered that it was funneling funds to the terrorist organization Hamas. SJP was co-founded in 2001 at the University of California at Berkeley (UC Berkeley) by Professors Hatem Bazian and Snehal Shingavi. Bazian served as president of the General Union of Palestinian Students (GUPS) while studying at San Francisco State University (SFSU) and headed the Muslim Students Association (MSA) while earning his M.A. at UC Berkeley. In 2004, while the second intifada was already winding down in Israel, he calledfor an intifada in the United States. Shingavi, an activist tied to the International Socialist Organization (ISO), has been criticized for using his literature course as a vehicle for promoting anti-Israel propaganda. SJP has grown to become the primary student movement advancing the Palestinian national agenda on North American campuses and is the primary force behind BDS campaigns at most schools. SJP activists frequently intimidate and harass Jewish and pro-Israel students. SJP members have physically assaulted Jewish students, aggressively disrupted pro-Israel events and possibly vandalized communal property. SJP rallies regularly include hate-speech and chants such as “Long Live The Intifada” and “From the River to the Sea Palestine will be Free” — calls for violence and for the destruction of the Jewish state. SJP chapters regularly host individuals linked to terrorist activity and speakers who use language considered anti-Semitic by the U.S. State Department. The Anti-Defamation League (ADL) has accused AMP of promoting “extreme anti-Israel views and has at times provided a platform for anti-Semitism under the guise of educating Americans” about Palestinians. The ADL further stated that AMP is directly involved in campus-based anti-Israel activity through Students for Justice in Palestine (SJP). Prior to founding the AMP in 2006, Dr. Bazian had created SJP together with fellow UC Berkeley Professor Snehal Shingavi in 2001. The close working relationship between AMP and SJP has been documented several times over the years by several organizations, including NGO Monitor and StandWithUs. In addition to providing financial, public relations and legal assistance to SJP, AMP has also been accused of having connections to Hamas. The AMP national board includes former members of both the Islamic Association of Palestine (IAP) and Holy Land Foundation (HLF), both of which were found liable for aiding and abetting Hamas. The IAP itself was founded by Mousa Mohammed Abu Marzook, current Deputy Chief of the Hamas Political Bureau and, according to the Associated Press, the terror organization’s number two political leader. The movement’s most notable achievement has been the infiltration of university campuses through lobbyingfor “BDS resolutions.” In these cases, backed by university anti-Israel affiliates, student governments have brought to vote on some form of boycott of — or divestment from — Israel and Israeli-affiliated entities. These resolutions, although non-binding, have been passed by student governments on numerous North American campuses. BDS activity is often aggressive and disruptive. It has been noted that universities that pass BDS resolutions see a marked increase in anti-Semitic incidents on campus. In 2013, when the student government of the University of California Santa Barbara (UCSB) debated a BDS resolution, reports emerged of violent threats and the spittingon a student wearing a Star of David necklace. As a result, the student government chose to vote via a “secret ballot” in order to ensure its members’ safety. With nearly 600 chapters located in the United States and Canada, the MSA is the most visible and influential Islamic student organization in North America, boasting conferences, special events, publications, websites and other activities. The organization includes a number of previous chapter presidents with explicit links to terrorist groups. Included are al-Qaeda cleric Anwar al-Awlaki (Colorado State University), Somali al-Shabaab militant leader Omar Shafik Hammami (University of South Alabama) and Pakistani Taliban recruiter Ramy Zamzam of the MSA’s Washington, D.C. council.